Gnometastic Beer Guzzling Garden Gnome by Gnometastic at The Net Stores Network. MPN: GCM-1703. Hurry! Limited time offer. Offer valid only while supplies last. Say HELLO! to our Beer Guzzling Garden Gnome! 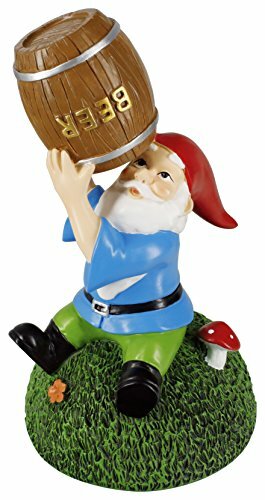 You never have to drink''a-gnome'' again now that you have this funny garden gnome to keep you company! Say HELLO! to our Beer Guzzling Garden Gnome! You never have to drink"a-gnome" again now that you have this funny garden gnome to keep you company! The Gnometastic Beer Guzzling Gnome brings the "Happy Hour" to your Beer Garden! This Tipsy little guy is a lightweight at 1lb. Stands 8.5" inches tall. Made from poly resin and weather resistant. Quality hand painted details include a mushroom, flower and keg. SAFETY TESTED: Certified Lead Free Paint. Complies with CA Proposition 65. All paints have been tested to conform with safety regulations. ____ Gnometastic represents not just humorous lawn ornaments but a lifestyle! Our Garden Gnomes have charisma, attitude and just a whole lotta in your face AWESOME (and a lil bit tacky). Embrace your inner love of Novelty! Give in to the Kitsch-y conga dancing in your head! Succumb to your secret anthem of Campy Fun! Be a part of this beautiful movement! Proudly display your Gnometastic - it's not just a lawn gnome - it's ART and a way of LIFE! // These quirky little guys will make a hilarious addition to any landscape they adorn, outdoors or in: your porch, garden, the kitchen, office (facing your boss's door), the bathroom (?!) or just about anywhere! If you have an appreciation for funny garden gnomes, or just posses an offbeat sense of humor, our unique garden gnomes will appeal to you and make great gifts for your family and friends and their friends! (Enemies too, but we take no responsibility for that one!) Made in China. Designed by 203 Brands Inc., Norwalk CT 06850. Beer Guzzling Garden Gnome by Gnometastic - Never Drink "A-Gnome" Again! Good til the last drop! It's always "Happy Hour" with this beer drinking, drunken funny little gnome. This tipsy fellow will make you laugh inside or outside. Funny addition to your garden, porch, home or office for an instant Beer Garden Party! SAFETY TESTED: Certified Lead Free Paint. Complies with CA Proposition 65. Hand painted and detailed accents on the grass, mushroom, keg and gnome. If you have any questions about this product by Gnometastic, contact us by completing and submitting the form below. If you are looking for a specif part number, please include it with your message.